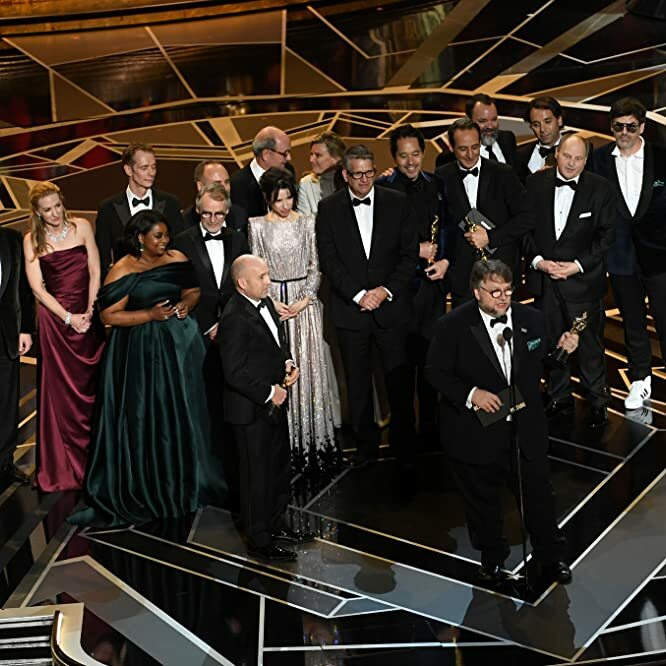 Here's a look at the best moments from the 2018 Academy Awards, as well as what trended highest among IMDb users during the telecast. 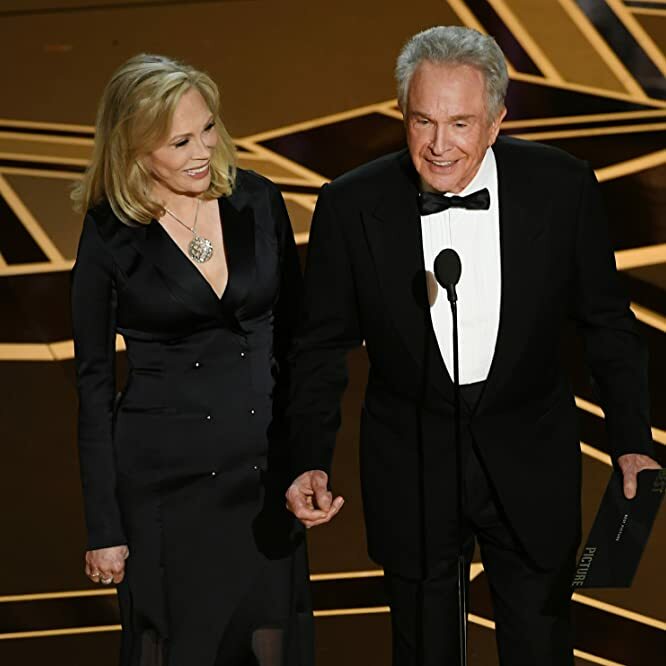 Up is down, Kobe Bryant has an Oscars acceptance speech under his belt, and Warren Beatty and Faye Dunaway have proven that they are incredibly good sports who are incredibly capable of receiving the correct Best Picture envelope. Those are just a few of the things we learned at the 2018 Academy Awards. Here are 10 of the telecast's top moments. The first science-fiction movie to win Best Picture, Guillermo del Toro's well-decorated feature led the pack with four wins out of its field-leading 13 nominations. It also brought a Best Director Oscar for del Toro himself, making him the fourth director of Mexican descent to win the award in the past five years. The Shape of Water also is the highest-grossing Best Picture winner in that time, pulling in $57.4 million thus far, and was the top trending movie of the night among IMDb users, based on their pageviews during the telecast. 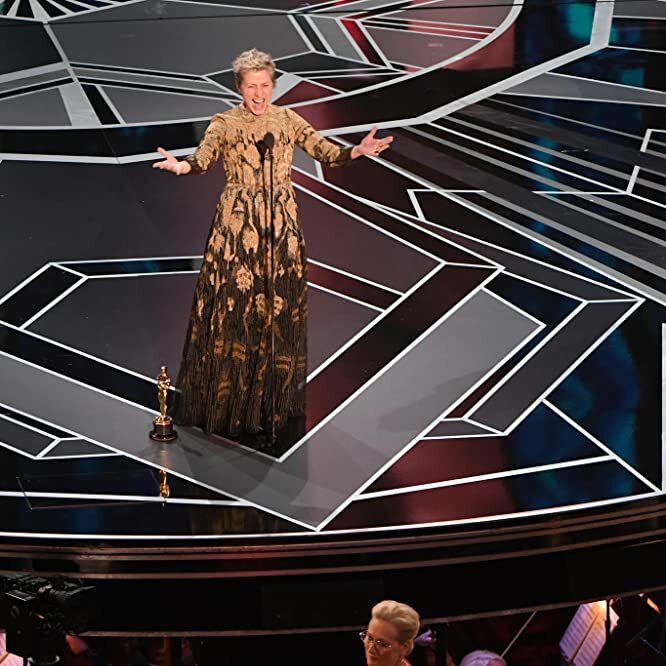 Although expected by many to land the Best Actress Oscar for her portrayal of a mother with wrongs to right in Three Billboards Outside Ebbing, Missouri, Frances McDormand started her acceptance speech with an air of unpredictability — and inspiration. First, she asked all female nominees in the crowd to stand. Then, she introduced viewers at home to the concept of an "inclusion rider," an equity clause that would allow actresses and actors to write into their contracts diversity and inclusion standards for the cast and crew of their projects. As she did at the Golden Globes earlier this year, Best Supporting Actress winner Allison Janney made sure to thank the bird that perched on her shoulder in I, Tonya — which, in her words, "elevated [her] work." Janney was the second-highest trending celeb during the Oscars telecast, based on pageviews from IMDb users. 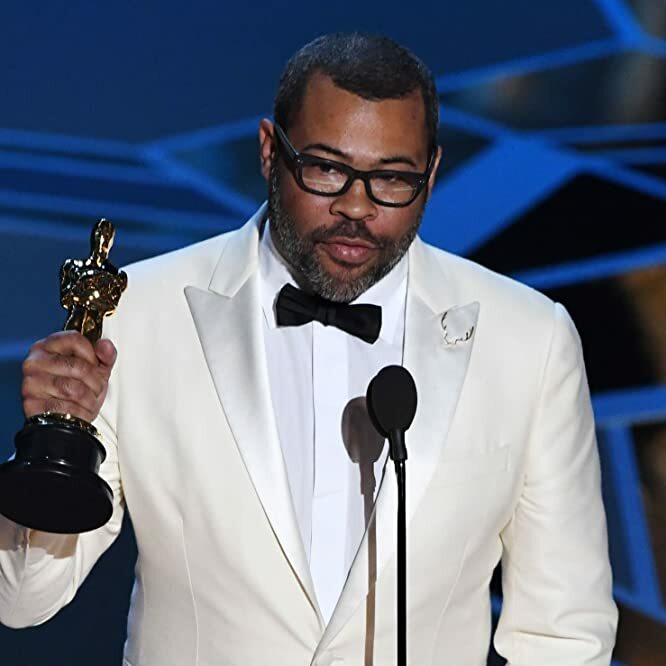 Although he did not take the trophy in the Best Picture or Best Director categories for Get Out, Jordan Peele became the first black screenwriter to win Best Original Screenplay. "I stopped writing this movie about 20 times because I thought it was impossible," he said. "But I kept coming back to it because I knew if someone let me make this movie, that people would hear it and people would see it." 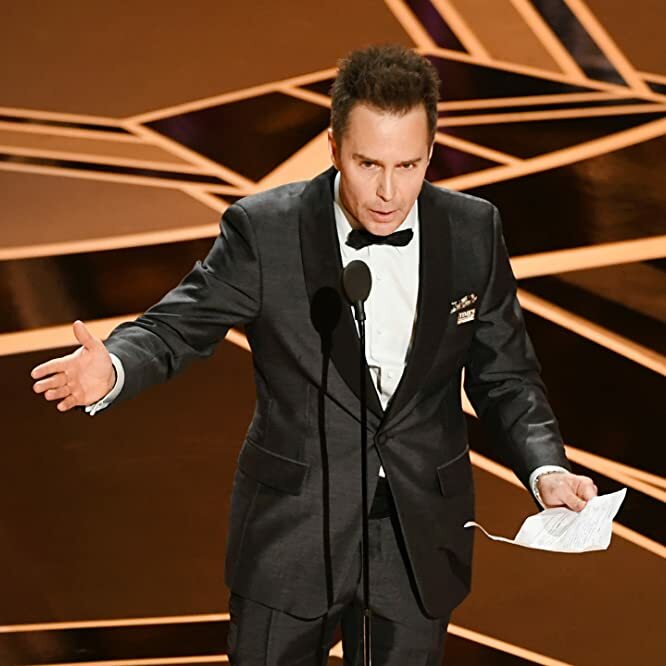 The character actor's character actor, Best Supporting Actor (and IMDb STARmeter Award) winner Sam Rockwell capped his acceptance speech with a dedication to the late Philip Seymour Hoffman, a three-time nominee in that category who also won Best Actor in 2013. It was a momentous night for Three Billboards star Rockwell, who also was the top trending star on IMDb for the night, based on users' pageviews. The planned #TimesUp segment during the 2018 Oscars telecast materialized with an appearance by three actresses who have accused Harvey Weinstein of assault. 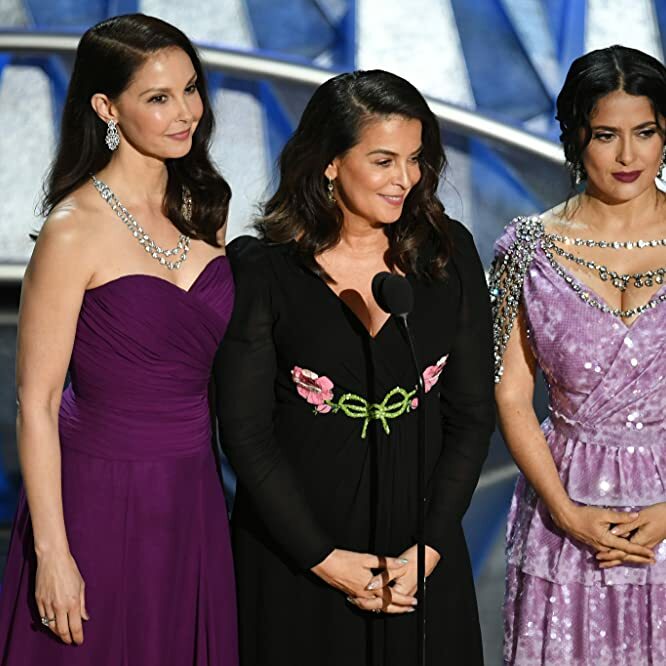 Salma Hayek, Ashley Judd, and Annabella Sciorra introduced a segment celebrating "equality, diversity, inclusion, and intersectionality," with Sciorra drawing much of the Dolby Theatre crowd's applause. 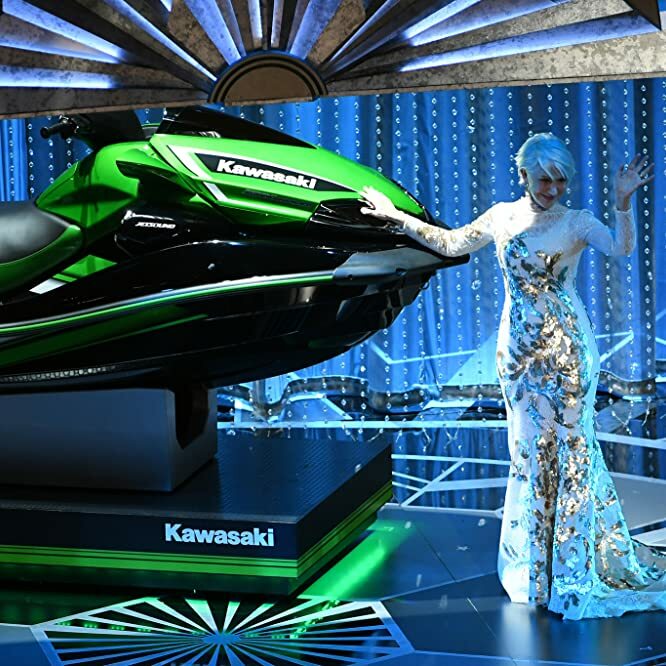 Somehow, Dame Helen Mirren played a hostess from an alternate-universe "The Price Is Right" so host Jimmy Kimmel could give a Jet Ski (plus a, um, trip to Lake Havasu City, Ariz.) to the Oscar winner with the night's shortest acceptance speech ... and the whole thing kinda totally worked. Congratulations to Best Achievement in Costume Design winner and new Jet Ski-owner Mark Bridges (Phantom Thread) and brevity. 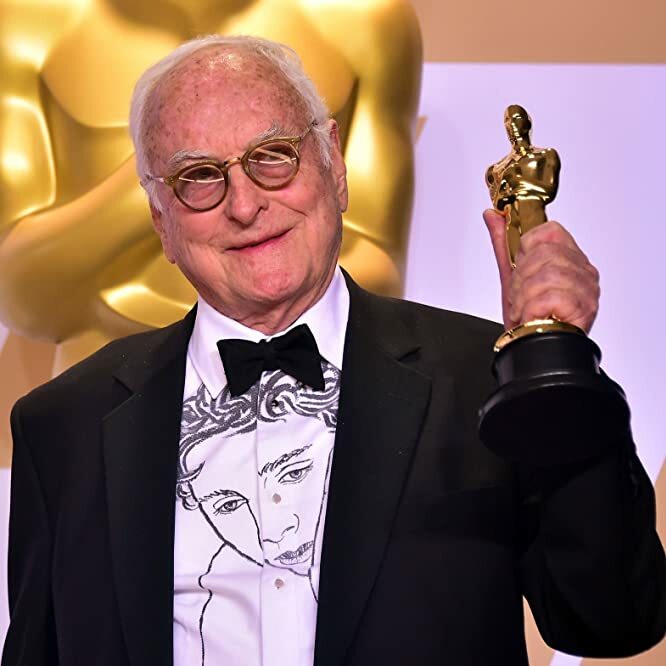 In addition to becoming the oldest Oscar-winner ever at 89 years old, Best Adapated Screenplay winner James Ivory paid tribute to one of the youngest-ever nominees: fellow Call Me by Your Name nominee Timothée Chalamet, whose likeness made it onto Ivory's shirt. 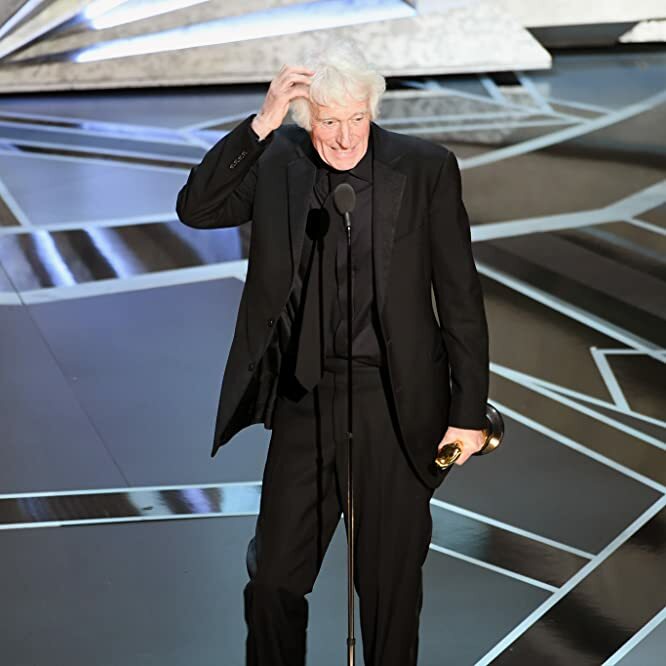 No more Susan Lucci or bridesmaid references for Blade Runner 2049 cinematographer Roger Deakins, who picked up his first Oscar in 14 nominations. His first Best Cinematography nom came in 1995, for The Shawshank Redemption. 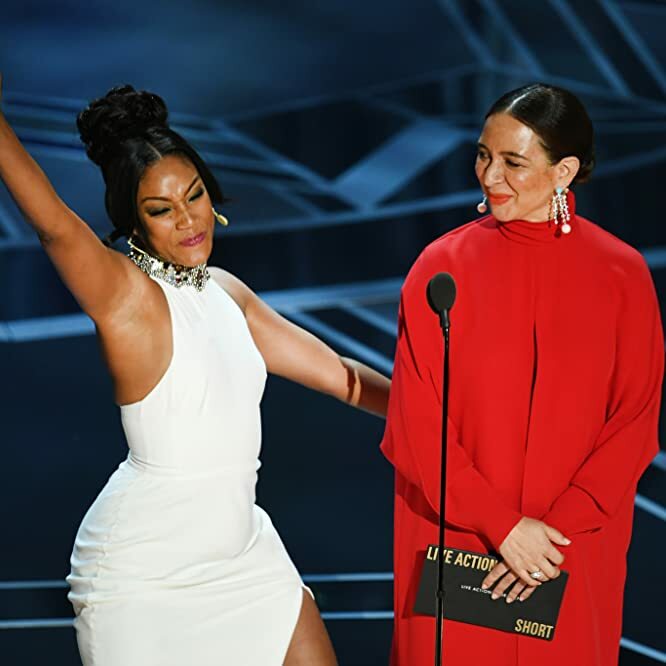 Tiffany Haddish and Maya Rudolph brought levity to a relatively issues-heavy Oscars in their presenting turn — with viewers taking to Twitter to nominate them as 2019's Oscar hosts. Why not? It may mean another appearance for Haddish's now-famously versatile white Alexander McQueen dress, on which she built a "Saturday Night Live" monologue about its reuse following its turn on the Girls Trip red carpet.